This colt is by the incredible sire I Am Invincible who produces not only incredibly preocious 2 year-olds, but also horses that train on over long, sound careers. Much like the dam of this colt's sensational mare, Streama who won in excess of $2.5 million in prizemoney and 10 Stakes and Group races, 4 of which were at the highest level. 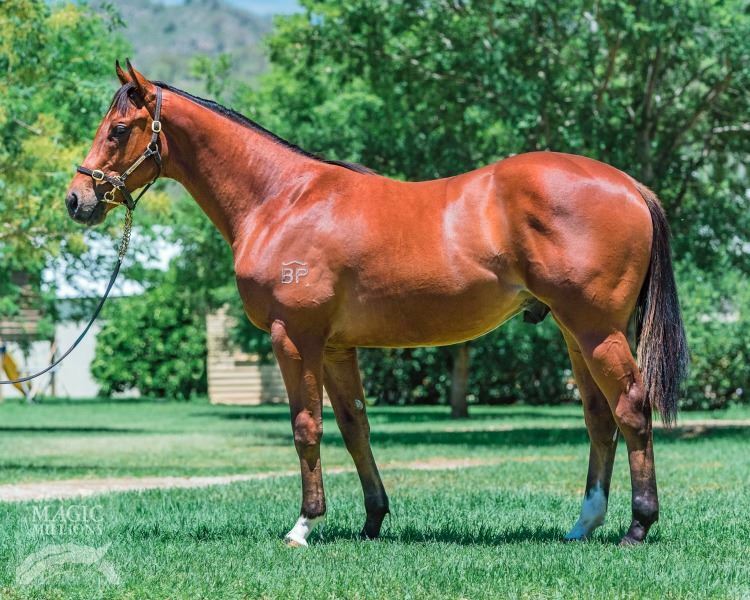 This colt is also from the family of top horse Decision Time, winner of over $1.7 million in prizemoney and the champion 2-year-old of his generation. I AM INVINCIBLE (AUS) (Bay 2004-Stud 2010). 5 wins-1 at 2, SAJC DC McKay S., Gr.3. Leading Aust. First Season Sire 2013-14. Sire of 515 rnrs, 382 wnrs, 44 SW, inc. Brazen Beau (VRC Coolmore Stud S., Gr.1), Viddora, I Am a Star, Voodoo Lad, Media Sensation, Oohood, Hellbent, Illustrious Lad, Invincibella, Fiesta, Pure Elation, Invincible Gem, Look to the Stars, The Justice League, Santos, Super One, Most Important, Houtzen, Eckstein, etc. STREAMA, by Stratum. 10 wins-1 at 2-from 1200m to 2400m, A$2,673,150, ATC Flight S., Gr.1, Australian Oaks, Gr.1, George Main S., Gr.1, BRC Doomben Cup, Gr.1, ATC Surround S., Gr.2, Tea Rose S., Gr.2, MRC Tristarc S., Gr.2, NSW Tatt's RC Furious S., Gr.2, GCTC AD Hollindale S., Gr.2, ATC Keith Mackay H., L, 2d ATC Epsom H., Gr.1, Vinery Stud S., Gr.1, Qld Tatt's RC Tattersall's Tiara, Gr.1, ATC Warwick S., Gr.2, Light Fingers S., Gr.2, Sweet Embrace S., Gr.3, Southern Cross H., Gr.3, Wiggle S., L, Grand Pavilion 2YO H., 3d ATC Queen of the Turf S., Gr.1, BRC Stradbroke H., Gr.1, ATC Silver Shadow S., Gr.3, Sheraco S., L, 4th ATC Doncaster H., Gr.1, Queen of the Turf S., Gr.1. This is her third foal. Her second foal is a 2YO. Her first foal is unraced. STREAMA (f Stratum) 10 wins. See above. Via Facile. 8 wins to 1550m, A$214,830, ATC Ranvet H., Sportsyear H., 2d ATC TAB Quaddie H.
Viascon. Winner at 1250m, ATC Drummond Golf P., 3d ATC Cellarbrations H., Testa Rossa at Vinery H.
Interna. 2 wins at 1200m, 1750m, 2d AJC Ethereal H., 3d AJC NCP Printing H., Kensington Twilight H.
Pawarna. 3 wins from 1200m to 1600m, AJC Phil Novacevski H. Producer. Social Cat. Winner at 1300m, 2d BRC Lyndhurst Stud H., BTC Tenterfield Saddler H., QTC Rain Lover H., 3d BRC SITA Environmental P.
Gypsy Magic. 10 wins to 1200m, S$329,233, Singapore TC Class 5 H.-6 times, Stepitup S., Kranji D S., Itmaybeyou H., 2d Singapore TC Kranji D S., Huat Chai S., Class 4 H., Class 5 H.-twice, 3d Singapore TC Initiation P., Kranji D S., Oscar Racing Stable S., Class 4 H.-3 times, Class 5 H.-6 times. Bright Encounter. 5 wins from 1400m to 1850m in Aust. Cordyceps. 2 wins at 1200m, 1600m, HK$2,107,000, to 2018-19, HKJC Kung Hei H., Sham Chung H., 2d HKJC Carpenter H., Lukfook Dear Q Collection H., 3d HKJC A Lange & Sohne Excellent H., Chevalier Healthcare Investment H., HKU Foundation & Faculty H.
Wings. 6 wins from 1000m to 1600m, A$169,190, 2d ATC Paslode H., Tab.com.au H., TAB Rewards H., Hyland Race Colours H., Remondis H., 3d ATC Save Our Sons H., Schweppes H., Ranvet's Salkavite H., Goulburn DRC Sera Country Championship Qualifier. Medic Corps. 5 wins at 1400m, HK$4,127,300, HKJC Audemars Piguet Tradition of Excellence H., Paris H., Daffodil H., Sha Lek H., Starlight H., 2d HKJC Pok Oi Cup H., Chatham H., 3d HKJC Kowloon Tong H., River Verdon H.
DECISION TIME (g Foreplay) Top Colt on The 2009-10 Australasian 2YO Classification. 11 wins-4 at 2-to 1400m, A$1,711,775, AJC Stan Fox S., Gr.2, ATC Show County H., Gr.3, NSW Tatt's RC Concorde S., Gr.3-twice, ATC Fireball H., L, STC Heritage S., L, Canberra RC Black Opal S., L, VRC Fiesta Star H., STC Rosehill Gardens Event Centre 2YO H., 2d STC Golden Slipper S., Gr.1, ATC Challenge S., Gr.2, STC Todman S., Gr.2, ATC Southern Cross S., Gr.3, 3d ATC Galaxy H., Gr.1, AJC San Domenico S., Gr.3, Scone RC Luskin Star S., L.
Star of Night (f Wicked Style) 5 wins at 1200m, 1400m, A$202,975, BRC Veuve Society Membership H., John "Bunny" Brasch H., 2d Qld Tatt's RC Tattersall's S., L, SCTC Racing Minister's 2YO Classic, BRC Eileen & William Duffus Memorial H., Moet & Chandon Chairman's H., 3d GCTC BJ McLachlan S., Gr.3, BRC Gollan Racing H.